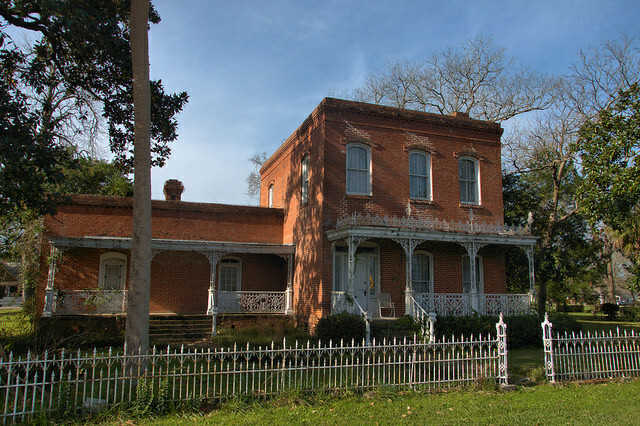 This spectacular Italianate is said to be the first brick house ever built in Telfair County, though I can’t confirm this. I’m hopeful that someone in Telfair County will work toward having it listed on the National Register of Historic Places. The cast iron fence and porch rails and columns were meant to replicate the rails of a steamship, and considering Captain Day’s machine shop background, he may have even designed them himself. While it was long said that Captain Day built the identical “triplets” a street over from this home for his three daughters, that has now been proven incorrect. Captain Day only had one daughter. They are now thought to have been built by Matt Cook. Captain Day did, however, own them at the time of his death. They were listed as rental properties. The following entry on Captain Day from the Biographical Souvenir of Florida & Georgia, (F. A. Batley Company, 1889) gives insight to his background, especially the tragedies of losing his father and brother in steamboat disasters: John L. Day, steamboatman, of Lumber City, Ga., was born in the city of New York, April 22, 1838, and is of English descent, his parents, Henry G. and Mary A. (Flint) Day, having come from Bristol, England in 1831. Henry G. became manager of a line of steamboats for the Georgia company, and in 1858, on a trip from Augusta to Savannah, while lying off Eagle Point, his cotton-laden vessel caught fire. The passengers and crew were compelled to jump overboard, and of the twelve or fifteen who were drowned, Mr. Day was one. His age was forty-nine. His wife died of yellow fever in Savannah in 1854, at the age of forty-five. Of the nine children born to these parents two died in New York in infancy. Thomas G. Day had been steamboating twenty-eight years and during all this while had not been on shore three months at a time. While engaged in navigating his vessel down the river he backed over her stern, and not being able to swim, as his father had not been, was drowned at the age of forty-three. Another of the family, Henry, a resident of Richmond, and married to Ellen Freeman, started for Augusta in 1869 to visit the subject of this sketch, whom he had not seen for ten years, but sickened on the train, was conscious for ten minutes only after meeting his brother and within four days died of brain fever, at the age of twenty-seven. Emily S. Day, married to Alexander Freeman, and Sarah A., wife of Chas. Mull, and Hannah L., widow of James W. Stout, reside in Richmond. John L. Day began business life at the age of fifteen, serving seven years with his father at three branches of mechanical industry-millwrighting, in the machine shop, and at pattern making. At the age of twenty-two he entered the employ of the government as a journeyman, and was in consequence exempted from military service. At the age of twenty-four he began business on his own account as a machinist, but soon changed, in 1867, to steamboating, and for the past twelve years has had three steamboats running on the Oconee and Ocmulgee Rivers in connection with railroading lines. He has made money, but has worked hard for it. In June, 1860, Mr. Day married Miss Mary R. Strobar, daughter of Francis and Martha A. (Beaasley) Strobar of Savannah, and this union has been blessed by the birth of four children, viz: Ida V., wife of John H. Barrett, of Lumber City; Harry G., who died in September, 1885, at the age of seventeen; John P., who died in infancy, and Tommie F. Mr. Day is a Royal Arch Mason, and he, wife, daughter and son are members of the Methodist Episcopal Church. Capt. Day is one of the leading members of his church at Lumber City. He has the enviable reputation of being a first-class Sabbath-school member, and is superintendent of a flourishing school in the Methodist Church of Lumber City. Captain Day’s obituary, from the 15 March 1906 Montgomery Monitor (Mount Vernon) called Captain Day one of South Georgia’s most prominent citizens. The best book available on the steamboats of the Altamaha, Ocmulgee, Oconee & Ohoopee Rivers is Carlton A. Morrison’s Running the River (St. Simons Island, Saltmarsh Press, 2003). There’s a good description of Captain Day’s activities, which are too extensive to list here. I really enjoyed the article on the Captain Day house, being from Telfair County, Milan, I have been to Lumber City many times, but never paid much attention to the house there. I love allyour articles, especially my home town ones. It’s on the railroad tracks in Lumber City, right in town, but I’m not sure of the street name. May be Railroad St? Thank You for sharing this information. I discovered this unique place a few yrs back and have been curious to know its history. This is a historical treasure and should be preserved if at all possible. Brian, I was fortunate to find this gorgeous dwelling on Google Maps’ street view after you posted it. When you visited, were you able to speak to an occupant or anyone associated with it? I just wondered, as it looks like a property that I might be interested in buying, should it be available. Then, again, it could be haunted??? YIKES! I wasn’t able to talk to anyone, Geoff, but I believe it’s presently occupied. I am from Lumber City and just bought an cleaned up an old 1890 Queen Ann farmhouse in a pecan orchard.I loved it’s history as well.Iv always loved the Day house.A Mr Pat Chapman owns the Day house now.He resides in Hazlehurst the next down across the river.